This international airport serves the Dutch part of the island of Saint Martin. 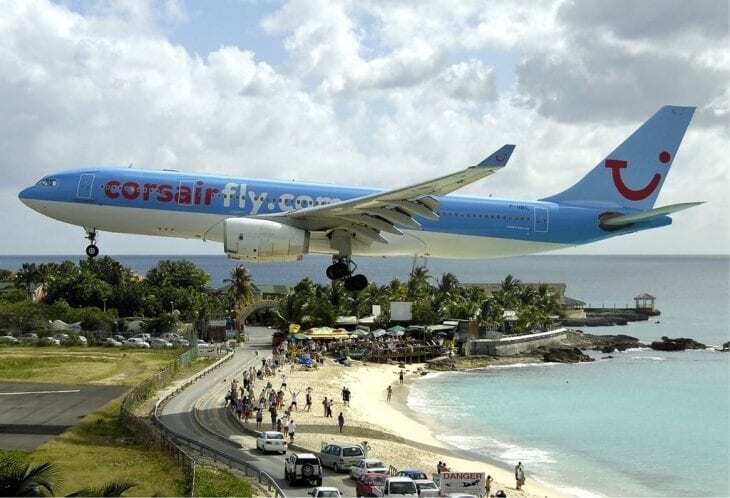 Due to a short runway and being extremely close to the shore, the airport is known for having giant jets fly over Maho Beach just 10-20 meters over the heads of the tourists laying on the beach, resulting in amazing photos. This airport is located on Saba island in the Caribbeans. It is located on one side by high hills and at both runway ends cliffs drop into the sea. Additionally, the runway at the airport is relatively short (400m) which creates a slightly higher risk for landing and takeoff. Experienced pilots talk about it as one of the most dangerous airports in the world. The airport is officially closed to traffic but regional airline propeller aircraft are able to land there under special waivers. Located on the island of Madeira (Portugal), this international airport has a short runway (just 1,400 meters before it was doubled in 2003) and is surrounded by ocean from the one side and high mountains from another. The new-built part of the airport is situated on a series of 180 columns, each about 70m tall. A small airport in the town of Lukla, Nepal. It was rated as the most dangerous airport in 2010 by the History channel. It is famous for being the place where most people start the climb to Mount Everest. Situated at a height of 2900 meters, its landing strip has a high mountain on one end and a thousand-meter drop on the other. This airport is located in, Courchevel, a ski area in the French Alps. The airport has a very short runway of only 525 m (1,722 ft) and a gradient of 18.5%! The runway has no instrument approach procedures, thus making a landing in fog and low clouds almost impossible. A short-runway international airport situated in the wide shallow bay in the island of Barra, Scotland. The airport is unique, being the only one in the world where scheduled flights use a beach as the runway. The beach is set out with three runways in a triangle, marked by permanent wooden poles at their ends which almost always allows the Twin Otters planes to land into the wind. At high tide these runways are under the sea: flight times vary with the tide. Emergency flights occasionally operate at night from the airport, with vehicle lights used to illuminate the runway and reflective strips laid on to the beach. The Ice Runway is the principal runway for the US Antarctic Program during the summer Antarctic field season due to its proximity to McMurdo Station. This runway is capable of handling giant planes. The annual sea-ice runway is constructed at the start of each season and is used until early December when the sea ice begins to break up. Pilots landing cargo aircraft on the sea ice runway report that the surface is stable, like landing on concrete. An international airport that serves the British overseas territory of Gibraltar. The unique feature in this airport is that the main landing strip of the planes passes through the main street of the city. Vehicles are made to stop every time an aircraft lands or takes off. A civil and military airport that serves Tegucigalpa, Honduras. The History Channel program Most Extreme Airports ranks it as the second most dangerous airport in the world. The runway is situated in a valley surrounded by mountains and there’s only one way in and one way out for the planes, which increases the risk dramatically. Despite these high-risk factors, planes as large as Boeing 757’s land at the airport on a daily basis. Located on the Caribbean island of Saint Barthélemy, this airport provides pilots and passengers alike with some fairly grave dangers. The corridor in which the runway has been built is incredibly narrow, and planes come frighteningly close to hitting the slopes of the adjacent upland area or plummeting into the ocean. There are warning signs asking the careless people not to take sun bathes near the runway. I came accross a new list that states how only few pilots have been trained to fly and land on these most dangerous airports in the world. This is really a good information but i want to know about the Pakistani Airports they are not in this list ? why ? Those are not dangerous ?